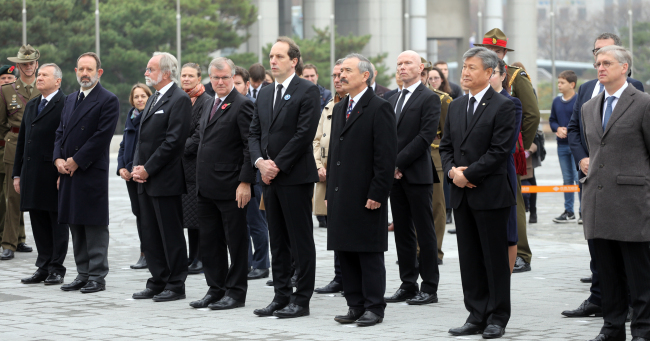 Marking the centenary of the end of World War I, French diplomats, veterans and their international colleagues paid homage to fallen comrades and active-duty servicepersons at a commemorative ceremony at the War Memorial of Korea in Seoul on Nov. 11. Veterans of the French Battalion in the United Nations Forces, Korean veterans, foreign diplomats as well as soldiers and officers took part in the commemoration. They were joined by students from the Lycee Francais de Seoul, Lycee International Xavier, Duksung High School and Seoul Foreign School, alongside French citizens in Korea. The French diplomatic mission and defense unit organized and led the remembrance of the signing of the armistice declaring the end of WWI in France. “As president of the French Republic, Emmanuel Macron, will emphasize in his speech today in Paris, which I will now quote, ‘It has been a century since the Armistice of Nov. 11, 1918, which put an end to the fratricidal combats of the First World War,’” French Ambassador to Korea Fabien Penone said in a speech. A century has passed since the armistice “put a stop to interminable conflicts pitting nations against nations and peoples against peoples; to trenches full of mud, blood and tears; to storms of fire and steel that tore apart the sky; and to bloody battlefields and the omnipresence of death,” he added. On Nov. 11, 1918, France heaved “a sigh of relief” emanating from Compiegne -- a commune in the Oise department in northern France -- where the armistice was signed at dawn, according to the envoy. Every French town and village commemorates the historic day to this day. Turning to the 1950-53 Korea War, Penone paid tribute to soldiers who gave their lives in defense of the Korean people’s freedom and democracy against communist aggression. Honoring the centenary, Macron inaugurated the Paris Peace Forum on Nov. 11, which will seek to strengthen global governance and find solutions to peace and security challenges worldwide.